Urban Aesthetics in Postsocialist China. Durham: Duke University Press, 2010. 376 pages. 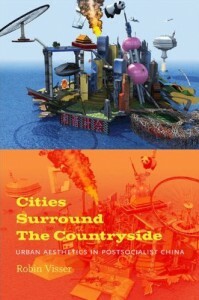 Robin Visser’s Cities Surround the Countryside: Urban Aesthetics in Postsocialist China is an ambitious work. It tackles literature, visual art, architecture, and film from the 1980s to the present. It does so, moreover, in the broadest possible terms, as can be seen in the book’s three major subject headings: 1. Conceiving the Postsocialist City; 2. The City as Subject; and 3. The Subject in the City. This conceptual scheme is intersected by a comparative treatment of Beijing and Shanghai, cities that, both in terms of their material reality and the ways they have been culturally construed, provide the parameters of a largely cogent and original analysis. Although its broad scope, as well as other aspects of the book, raises some questions in this reviewer’s mind, in most respects the benefits of Visser’s approach outweigh the shortcomings. And sometimes a shortcoming becomes a strength: for instance, the very difficulty of sustaining the essential binary of Beijing and Shanghai supports important aspects of Visser’s analysis. Though the work is structured in terms of these two cities, long characterized by the jingpai/haipai dichotomy, their actual distinctiveness is now becoming increasingly muted in the cultural texts that depict them. This fact is one of the main themes of Visser’s work–namely, the ways in which global, neoliberal forces conjoin with new patterns of local wealth and power to effect change on the Chinese urban landscape despite the often unreasonable, even unethical, or at least environmentally questionable, aspects of that change. By contextualizing literary, architectural, artistic, and cinematic works in light of these forces, Visser manages to align them into a meaningful array, one which addresses space-place configurations that no longer conform to a narrowly-defined and outmoded urban-rural dichotomy. She demonstrates how these emergent socio-geographic configurations help give rise to a network of elite Chinese artists, architects, writers, and filmmakers, not to mention intellectual figures such as Shanghai University’s Wang Xiaoming or Tsinghua’s Wang Hui, two scholars who have been instrumental in shaping a counterweight to neoliberal thinking in the Chinese academy and elsewhere. Visser’s attention to and description of the conflict between artists and intellectuals concerned with the negative impact of rapid and often ill-considered neoliberal economic development is a core and compelling aspect of her study. The book is not without its problems. To begin with, generic: fiction is the principal expressive mode Visser focuses on, though a wide variety of visual and performance art and film texts are treated extensively in the course of her analysis. I wonder why poetry is left entirely out of this landscape, particularly as poets were arguably the first to respond to ironies of neoliberal thinking in China and did so from poignantly urban perspectives. The early work of Yan Li, a poet-artist who notably splits his time between Beijing and Shanghai, is a good example of such poetry. Furthermore, given the centrality of geographical concerns, I wonder why there is not more attention paid to the phenomenon of art districts in Visser’s work. The by-now famous 798 Arts District (Dashanzi) in Beijing, which came into prominence around 2000 and which was followed closely by Moganshan Road district in Shanghai and similar districts other cities, gets a scant four pages in Visser’s work (77-78; 170-171); Moganshan gets none. When Dashanzi is mentioned, moreover, her discussion by and large follows biographical trajectories (e.g., the Gao brothers, Zhang Dali) or generic discussions of the development of Chinese performance art. By and large, Visser takes experiences of individual artists or their works as targets of analysis. While this approach is warranted in some cases (examination of the work of Huang Rui [77-78; 291] or Hou Hanru [68; 79], for instance), individual-based analysis of art works misses the importance of art districts as collective sites of resistance to ideological or economic manipulation, which is their real importance. Visser does engage briefly in such analysis with her discussion of the “Dongcun”(East Village) of Beijing of the early 1990s, but does not sustain it for later developments after 2000. Given the subsequent emergence of such districts (beginning with 798, but including art districts all over China) as veritable incubators of both avant-garde expression and neoliberal economic and cultural development, one would think this would fit nicely into the parameters of Visser’s work. The strength of this observation is again mitigated by the fact that for many of the contemporary artists Visser discusses, most notably Shi Yong, the primary focus is on their individual experience as artists, a particular experience from which generalizations about the broad Chinese public are not easily made. Still, the strengths of her work are notable. Visser begins with broad questions, e.g. “What happens culturally when those in a historically agricultural civilization start to identify primarily with the city” (1), and with far-reaching observations e.g. “the logic of market place supplant[ing] earlier ethical and regulatory paradigms” (7), and goes on to explore them cogently. Most ambitious, though, is Visser’s attention to the ethics of development, explicitly in the sixth and final chapter “Postsocialist Urban Ethics,” but also throughout the entire volume; this ethical orientation is something that sets her work apart from much of cultural studies scholarship. Ethical concerns emerge in a wide range of textual discussions, from Wang Shuo’s tendency toward “mocking” literature (105), Zhang Yimou’s capitulation to the Western market’s taste for foreign exoticism (106), and the performance art movement of Zhang Dali et al. (158-174). But they more form a center or core of her analysis in the final chapter, and this makes her drawing together of cultural texts (fiction, film, architecture, visual and performance art), urban planning, and the field of Chinese Cultural Studies itself, an altogether more worthwhile project. Pay special attention to commercial advertisements, entertainment magazines, popular music, soap operas, newspapers, TV shows, window displays and public decorations. . . buildings, publishers, government bureaus; bars, dance halls, and coffee shops–all should be our province. (118). Only by tackling such a diverse array of textual evidence can the researcher, in Visser’s words, fully “unmask the myths supporting this persuasive new ideology”(ibid). Still, most of the time Visser’s attention passes by the window displays and other decorations and focuses by and large on highbrow cultural texts. She does so, though, on a strong theoretical foundation, one that seamlessly includes critics from China and the West, and ranges from the commonly-cited Walter Benjamin, Homi Bhabha and Pierre Bourdieu, to the less commonly-seen Robert Bellah (261). For instance, her discussion of the public as a mode of Lacanian “méconnaissance,”where integration into the thriving (or just congested) public space is seen as a struggle toward identity formation in not only Chinese urban but neoliberal global space, constitutes an excellent blend of urban and theoretical studies. The connection of this material to a variety of cultural works, particularly in analysis of psychological struggles as they are manifested in literary works (e.g. Chen Ran’s Private Life and Sun Ganlu’s Breathing) mark the true achievement of Visser’s book. In that discussion, the public-private dichotomy is described as a kind of frail structure generally characterized by flux. As Chen Ran, cited by Visser, puts it: “The solemn and heavy breath of Beijing spreads through the house and fills my lungs. Like ashen, dirty time, it forever clings to the arms of all good people as it leads them silently away” (235). These are poignant words in the context of Visser’s ethically oriented view of contemporary cultural texts. In Cities Surround the Countryside, Visser does an excellent job of demonstrating that coordinated analysis of various dimensions of urban experience is a profitable way to read cultural texts. The work was clearly developed over a long period of time, culled from the author’s earlier and perhaps only loosely-related studies going back a decade at least. The importance of the collective contribution of this research, though, is a product of the present moment, when Chinese urban development continues at break-neck pace despite pointed questions–most recently surrounding the high-speed train accident in Wenzhou–about the wisdom of moving quite so fast. Generally speaking, it appears that China’s unprecedented urban growth will continue, and that neoliberal forces will drive deeper into Chinese cities, generating further degradation of the environment and alienation and identity crises among its residents. Meanwhile, Chinese artists, writers, and intellectuals will continue to respond to these developments in rich, creative, and perhaps even politically potent ways. Fortunately, we have books like this one to take full account of such creativity and to thoroughly (as much as is possible) contextualize it.